You're campaigning to be President of the United States. Your campaign tells you that a Christian minister who is supporting you once called Islam as a "conspiracy of spiritual evil," and regularly makes similar disparaging remarks about that religion. You know that, if elected President, Muslims around the world will remember how you handled this situation. What do you do? (A) Drop him faster than a greased bowling ball. (C) Describe the minister as "one of the truly great leaders in America, a moral compass, a spiritual guide." Sigh. Sadly, McCain answered C. After eight years of not-even-half-baked efforts at public diplomacy with the Islamic world, McCain isn't exactly signaling that he'll do a substantially better job. Perhaps the defining characteristic of a religious zealot versus other types of religious believers is the constant sense of outrage that the zealot has to maintain. If you read the public statements of leaders from Al Qaeda, the Muslim Brotherhood, Hezbollah, Abu Sayyaf, the Taliban, and other Islamist groups, you'll see this constant, angry refrain. To sustain outrage, religious zealots often stretch reality out of shape to manufacture new reasons to be angry. The bizarre conspiracy theories you hear from the Middle East--for example, an international Jewish conspiracy had advance knowledge of the 9/11 attacks and warned Jews working in the World Trade Center not to go to work on that day--undoubtedly arise from this source. Having seen this sustained, manufactured outrage at work in other societies, we should be on our guard against its appearance in our own. Americans should therefore be skeptical about the alleged "war on Christmas." As this excellent, thoughtful, and honest post at Poliblogger shows, there are lots of good reasons why people say Happy holidays instead of Merry Christmas. Since the retail sector of the US economy depends on Christmas sales for half of their sales, a solid majority of Americans identify themselves as Christians, and there's no confusion over whether December 25th is Saturnalia or Christmas, the whole "war on Christmas" is ridiculous on its face. However, there are people who, for their own reasons, want to invent conspiracies where none exist. "Islam teaches that Muslims must wage war to impose Islamic law on non-Muslim states." No, it doesn't. The goal, giving all Muslims the opportunity to live under Shari'a law, doesn't depend on military action. In fact, reputable Islamic scholars would agree that war should be the last resort, not the first. They would also tell you that jihad, often misused as a synonym for religious war, actually refers to the Muslim duty to struggle to live a pious life. "Today's Jihad terrorists have the same motives and goals as the Muslims who fought the Crusaders." Only if you strain so hard to find similarities that you could just as easily make the statement, "The French resistance had the same motives and goals as the Muslims who fought the Crusaders." The Crusades were a muddle of internal and external conflicts. Muslims fought Crusaders. Crusaders fought Muslims. Muslim leaders fought each other. Christian leaders fought each other. "Jihad terrorists," on the other hand, aren't facing anything like the Crusader invasions. Groups like Al Qaeda and the Muslim Brotherhood might strenuously argue that Americans are just Crusaders in disguise—which should lead you to ask yourself why anyone here in the West would want to agree with them. "The Crusades were defensive conflicts." No doubt, the Crusades happened because of a widespread desire to liberate Jerusalem from Muslim control. However, that's a strange way to describe them as a "defensive" conflict. In 1099, Christians living in Jerusalem had been subject to some recent, minor persecution, including an Egyptian caliph's threat to destroy the Holy Sepulchre. Nonetheless, Christians were still the largest religious group in Jerusalem, and there were no streams of refugees eager to escape. 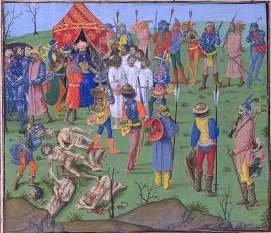 In fact, the rumors of horrific persection that motivated the First Crusade later turned out to be false. True, Muslims and Christians sparred for centuries before and after the Crusades, with Christian rulers evicting Muslim armies from Spain, Sicily, the Balkans, and other portions of what we now consider Europe. True, Muslim corsairs often took Christian prisoners captured in raids as slaves. However, medieval Muslims had their own, equally justified set of complaints about the actions of Christian rulers, not least of which was invasion of a lot more than just Jerusalem during the Crusades. "Muslim persecution of Christians has continued for 13 centuries—and still goes on." I don't have the space here to perform a thorough analysis of Christian versus Muslim persecution, using the weights and measures of historical suffering. However, it would be ludicrous to say that Muslims didn't suffer at the hands of Christians, such as the Tsarist persecution of Muslims in Central Asia. I'm not even sure what the point of this claim is, exactly. Are we comparing prison experiences? The number of killed and wounded? The free exercise of a minority religion? The history of Islam is far from spotless. For example, the history of the Crusades is a story of frequent stupidity and brutality on both the Christian and Muslim sides. However, the authors of The P.I.G to Islam are clearly trying to weave all of Islam into one infernal web, as if Christian Reconstructionists were representative of all modern Christians. In another post, I exhorted people to go read more books about Islam. Please skip this one. There is something called "the Middle East" that's comparable to "Western Europe". Not even close. Sure, there are strains of cultural continuity here and there, but for the most part, it's hard to lump together the Sultan of Brunei, a Berber clan leader, the wife of a Western-educated Saudi engineer, and a religious scholar in Qum and have anything meaningful to say about all of them. The cultural boundaries that separate these societies are palpable, though, but that says more about how we feel different from them than, say, the four individuals cited above feel kinship to each other. Americans have an idea about elections: everyone in the world sees them the same way It's a nice idea, and to a limited extent, it's true. (I'm not one of those people, for example, who tries to twist the message of the Tienanmen Square protests into something it wasn't. I'm mortified by academics who argue, often to keep access as China specialists to the subject of their research, that these poor, beknighted Chinese students just didn't understand concepts like democracy and liberty the way we do.) However much people might agree about the mechanics of how elections work, not everyone sees their goals or outcomes as equally desirable. (In this vein, Frances Fitzgerald has an interesting discussion of the South Vietnamese elections in Fire in the Lake.) Elections certainly are not a silver bullet, and they're not necessarily as effective a tool of building national identity as, say, common service in the national military (one of the ways nationalism in Western Europe grew). In fact, elections can push societies in exactly the opposite direction: the electoral struggle over whatever tangible or intangible goods the government has to offer can aggravate animosities among different ethnic groups, clans, sects, or other divided parties. This is Fareed Kakaria's point in The Future of Freedom, and I think it's a hard one to dispute. Whitaker's series is a great starting point for discussion, however, even if you or some of your friends take issue with anything in these articles. Certainly, these articles make it crystal clear that, like "the handover of sovereignty," elections in Iraq could happen in form, but in substance, they could be worthless, or even worse than worthless.